With the holidays literally just around the corner I thought Crocheted Gifts would be the perfect giveaway to run. Now is your chance to win this fabulous book full of great gifts to make and give. 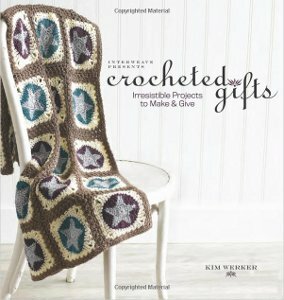 If you have time to make projects from this book for the holidays there are so many to choose from, if not, you can make them year round for any occasion. Birthdays, Mother’s Day, Sweetest Day; there’s something for all in this great book. You will see a robe, a rug, jewelry, hats, bags, dishcloths, shawls and so much more. Everything you have ever wanted to make is right here in this single book. Small fires, small hot dogs, and small children are all more comfortable when enclosed in a blanket. So what could be a more appropriate gift when a new life enters your orbit than a handmade blanket that they can cherish for years to come? Well, I’m proud to say that if you’ve got an infant you want covered, we at AllFreeCrochetAfghanPatterns have you covered with our new eBook, 10 Crochet Baby Blankets. If you have the interest, we’ve got the steps for success. Beginners can warm up by making the simple and neat Easy One Ball Baby Blanket, while advanced hook-jockeys can try their hand at the rainbow-colored (and aptly-named) Coziest Crocheted Baby Blanket. For the crocheter on the go, the Squares in the Corners Baby Blanket consists of 36 smaller separate squares, making it ideal to work on piece by piece, or all at once if you happen to have 18 extra hands. Did I mention that you can download this eBook for free, right now? Just consider it a congratulatory gift from us to you. Download 10 Crochet Baby Blankets Today! What kinds of crafts do you think make the best gifts on the occasion of a new baby? Leave a comment below and tell us? For today’s topic, Homemade Crochet Gifts, we’re sharing a Crochet Christmas Tree Skirt. Crochet a lovely Christmas tree skirt using one of Roseanna Beck’s free crochet patterns. Red, green and white give this tree skirt a festive look that will match your other Christmas decor. Meanwhile, what homemade Christmas crochet gifts are you making this year? (And if you don’t crochet, what crochet gift would you like to receive this year?) Leave a comment below – one lucky commenter will receive a Gift from Santa’s Sleigh. Hurry. You only have until Midnight central time to enter. Tomorrow will be another day, another featured project, and another giveaway!